How do you actually make perfume? For AbdesSalaam, the fundamental starting point is with an idea or thematic concept for your creation, one that is as simple as possible. Again and again, AbdesSalaam returned to the Guerlain quote discussed in Part I on the importance of simple ideas, and emphasized that you should not get lost in your own fantasy or over-complicate things. Once you have the idea, then you try to render it concrete by blending materials in accordance with a formula that is centered first on the main accord, then on secondary elements. Bottles of the more than 15 blends I made. Photo: my own. AbdesSalaam slowly walked us through this process, starting by asking each of us our personal idea for a future fragrance, the possible notes that may be involved, and a potential name for the scent. My classmate, “M,” thought of a fragrance called “Lost Innocence,” encapsulating scents of her childhood with incense, rose, and blackcurrant as the mainstay notes. My table mate and lab partner, Manuel, also had incense and rose as part of his tribute to a chapel on his family’s old estate in Cuba, but he wanted the greenness of oakmoss and neroli somewhere in there as well. For Zenobie, a lover of gourmands, her concept centered around ice-cream, while Matthew sought to bottle the smell of his mother’s horses, right down to their poop and the peppermint used to keep flies or mosquitos away. Tasneem or Tasnim. Photo: AbdesSalaam via his website. My idea was partially derived from the lingering effects of AbdesSalaam’s outstanding ylang-ylang soliflore, Tasneem, that I had tried earlier that day and that I’ve talked about in Part III. I wanted to make a floral oriental with an underlying gourmand streak, but it would be my personal idea of “gourmand” notes, rather than the conventional ones. AbdesSalaam’s superb Peru Balsam on the organ before me had truly blown me away with its rich, spicy sweetness, while his vanilla had surprised me with its woody aromas and an unexpected dryness floating from the top of the bottle. So, both of those would accompany the beautiful Ylang #1 in “Golden Luxe,” the possible, working title for my future scent. AbdesSalaam listened and took notes on each proposal, but came to firm stop after Salman’s idea on making a fragrance for his mother, encapsulating the scents that he associated with her and with his childhood. Salman’s mother would always wear jasmine in her hair, but also smelt of roses and the spices that she cooked with. He recounted memories of coming home from school to be enveloped in her warm hug, fragrant from the treats she had made him, as well as the flowers in her hair. AbdesSalaam kept circling back to Salman’s concept, honing it further and further down to its simplest form. What we hadn’t initially realised was that he was asking us for an idea that could be simultaneously narrowed and broadened to have wide appeal on a theoretical basis. With Salman’s proposal, he’d found something which could be broadly accessible to a larger audience: the scent of a mother with spicy and floral oriental notes, a story that would appeal to people beyond simply the specific ones in the story. It was almost a universal idea when slashed to its core basics, and one that would now become the basis for our first foray into perfume creation, because each of us would be making this scent. First, AbdesSalaam worked with Salman to come up with a name, settling on “Sindi Mother” (or “Sindhi Mother”) with “Sindi” being the name of the region of Pakistan where Salman was originally from. After that, there was the matter of settling on the perfume’s main olfactory bouquet. 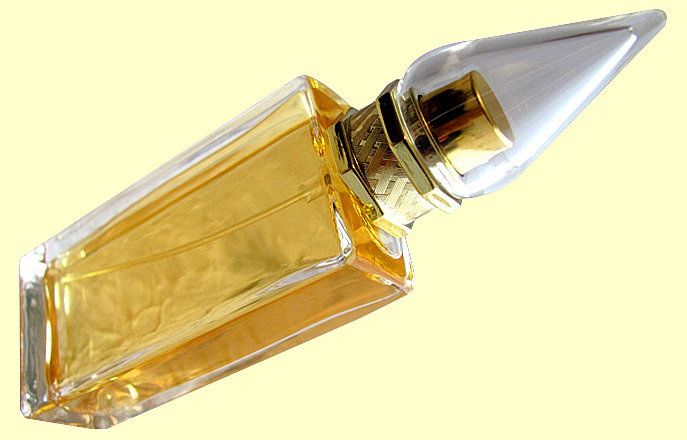 A perfume should have a driving force or central character stemming from a main accord. For AbdesSalaam, that accord should consist of three ingredients, maximum. In the case of Sindi Mother, jasmine and rose were clearly two of them, based on Salman’s memories. What should be the third? They discussed various notes, their applicability to Salman’s memories but, more importantly, to the profile of the region in general. They settled on cinnamon as the third core note. 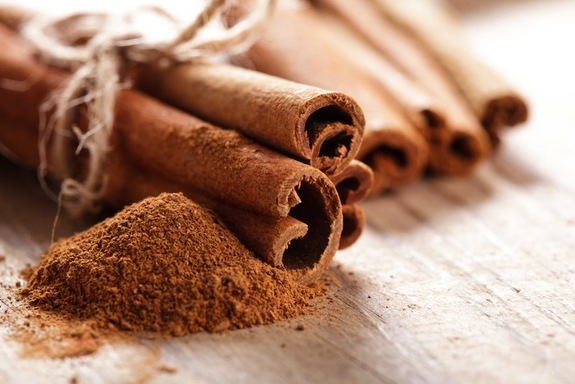 One reason why is that AbdesSalaam believes cinnamon is the main archetype for spices in perfume language, in addition to being a big part of SE Asian cuisine. Once you have the main accord, you must think of what would work for the secondary elements. For AbdesSalaam, when you’re pursuing a theme-based perfume, the symbolic character of the overall scent should drive you in choosing these additional ingredients. For example, what else is strongly evocative of either South East Asia (India and Pakistan) or their cooking? Obviously, sandalwood fits the former, while cardamom was a strong candidate for the latter. That gave us 5 notes. We needed one more. In general, the blending formula that AbdesSalaam suggested to us was a very basic one that was designed to keep things as simple as possible (and not to overwhelm us). There should be three notes for the “main accord,” and another three as the “secondary elements.” AbdesSalaam settled on almond as the sixth and final ingredient, because it was very common to Pakistani desserts or cooking, and therefore something which would symbolically represent Salman’s core idea of his mother’s scent. That shows we started with 5 drops of rose, then added two more, followed by yet another 1 drop for a total of 8. In actuality, we generally used far greater quantities for each of the main accords, unless it was something very powerful like seaweed, oakmoss or cinnamon, but that line should give you a basic idea of what I’m talking about. One thing that AbdesSalaam warned us was to be extremely careful with the cinnamon, and not to use more than a single drop at first because it could quickly overwhelm the entire balance of the composition. We could always add more later as our formula developed. He was right in stressing caution because his cinnamon had a major punch. That was even more true of his almond essential oil which, as a few of us later learnt, was so incredibly powerful that the tiniest amount almost overwhelmed and blitzed the other notes, resulting in some people scrambling like mad to increase the quantities of their core trio to prevent their blends from turning into almond soliflores. A small wrinkle in all of this is that a few of the bottles had droppers which emitted oils with painful slowness (you could be waiting up to a minute or more for a single drop! ), while others rapidly streamed out their contents almost like a flood. AbdesSalaam showed us how to hold the bottles over our atomiser/decant in a way designed to give us maximum control over their emissions, but there were still a few accidents here and there. It was now up to each of us to decide how we would personally complete the vision of Sindi Mother. No two formulae would be alike, as each person decided by scent and individual preference how much or how little they wanted to add. The very first difference involved the choice of jasmine. AbdesSalaam had said we should use Rose Absolute, the same Bulgarian rose damascena oil mentioned in Part II that had blown us away on the night of our arrival, but we had two options for the jasmine. There was the Sambac which smelt indolic, opening with a blackened camphorous note before quickly blooming into something more spicy, sensuous, and full-bodied. 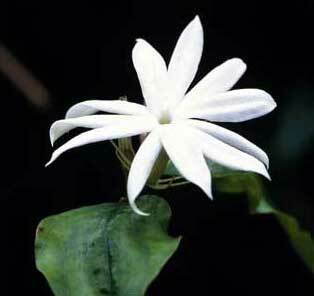 Then, there was Egyptian jasmine that was much sweeter, fruitier, lighter, softer, and without an indolic blast. I normally love my jasmine to be as lush, blowsy, and heady as possible, so the Sambac is usually my thing in blended, finalized perfumes, but I was surprised here to consistently gravitate to the Egyptian jasmine instead. So, while everyone else opted for the Sambac, Zenobie and I chose the Egyptian variety instead. I’m not someone who is very keen on rose fragrances, so I was surprised by how much I liked the trio in those quantities. 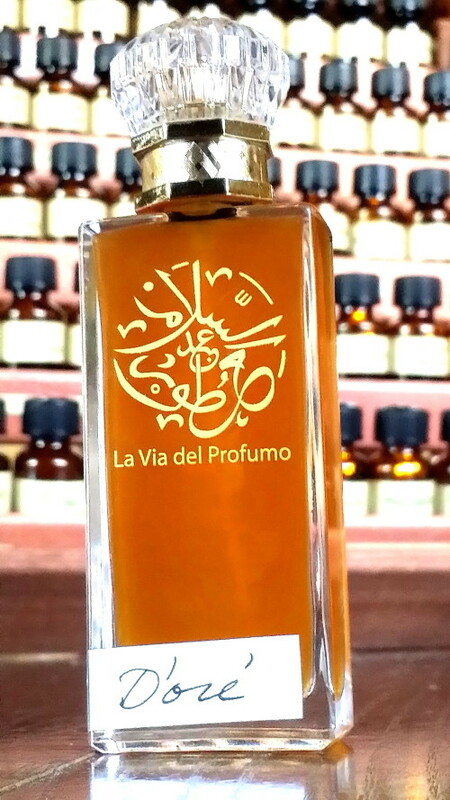 A number of others were drawn to it as well, with Salman far preferring the impact of the Egyptian jasmine in my formula to the Sambac in his. The more I smelt my trio, the more I rather liked it just as it was. For AbdesSalaam, only God can create perfection, and we must be happy when something is simply “good.” He believes that when you smell a blend and think that it’s good, you stop. “It is enough.” I struggled to wrap my mind around this concept. In all honesty, I found “simply good” to be incomprehensible; I just don’t think that way! It didn’t help that, as noted above, I love details — and the more the better, as these posts amply demonstrate. For me, simplicity of composition and a calm, serene acceptance that something is merely “good” is wholly antithetical to my character, which brings me back to my formula for the main accord in our “Sindi Mother” project. To my surprise, I actually liked it, everyone else thought it was wonderful, and I was oddly loathe to ruin it by adding more, particularly the explosive almond which had bulldozed over several classmates’ compositions. Was my formula “Sindi Mother”? No, not even remotely. But it was a very pretty, appealing take on a simple, spicy floral. For AbdesSalaam, the key was that I liked it, despite continuously being my own worst critic. So he told me to leave it as it was. Finished, end of story. He said I should give the blend time to settle by leaving it overnight, since time makes a difference as to the final balance through maceration. My simple, 3-note scent on the far left. 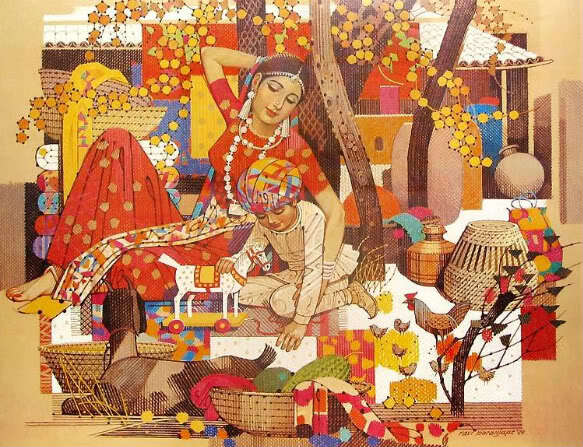 Manuel’s “Sihndi Mother” is on the right. Photo: my own. In the end, however, days later, I actually didn’t like my fragrance all that much at all. It was okay, nice I suppose, but overly simplistic, terribly boring, and, yes, a little flat. I know I’m always overly critical of my own work, but I truly thought it had no pizzaz at all, probably because there were only three notes in it and I’m someone who loves layers. My classmates had all created full “Sindi Mother” compositions using the secondary notes to varying degrees, and my table partner’s creation was simply beautiful! To this day, Manuel’s “Sindi Mother” remains one of my favorites from the class, filled with complexity and spice atop a strong sandalwood base. I won’t share his formula lest he decides to do something with it later for his business, but it’s a far better composition than a good number of orientals from established houses that I’ve reviewed. Yet, his blend actually hadn’t seemed so robust, bold, or exciting the day before. One small reason why was the quirky character of the sandalwood, Santalum Spicatum from Australia. No matter how much everyone applied, the wood seemed oddly subdued in my classmates’ blends. It was only the next day that the wood bloomed, coming out of the shadows to suddenly show its face and to add character to each composition. The larger reason why Manuel’s perfume improved so much overnight is because of a general principle that I briefly referenced earlier, though it does relate to the situation with the sandalwood: time changes all things. You have to give a blend plenty of time to adjust and for the notes to recompose themselves before you finalise the formula and mix it with alcohol. AbdesSalaam said he commonly left his compositions a few days before coming back to see how they had changed or developed. Obviously, we didn’t have that sort of time, but I think it’s a lesson to keep in mind if you start to make perfumes for yourself: how something smells today is not how it will be tomorrow or even the week after. That’s not always a bad thing, though, because some blends can actually improve over time. For example, sharper top notes can become rounded out or counterbalanced by the other elements; or the underlying nuances in the base might develop further. Be that as it may, the way my quasi “Sindi Mother” turned out was so boring (to me) that I became determined to add as much nuance as I could to upcoming experiments. Our next project was to work was to work with our table mate to make each other’s original perfume idea. For Manuel, it was the scent memory of his family’s old chapel in Cuba before the revolution forced them to leave. He knew he wanted incense, oakmoss, and neroli, but we worked together to find the suitable levels. 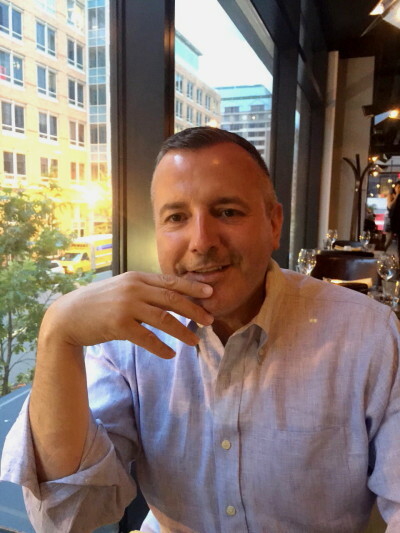 He was, in effect, my “client,” so I made suggestions for what might fit his vision. Given the intensity of AbdesSalaam’s Somali frankincense oil, we both agreed that it should be part of the secondary elements along with the opoponax (or sweet myrrh). Since he loves citruses passionately, and the neroli wasn’t sufficiently crisp or fresh in the mix, I pointed him to petitgrain bigarade and mandarin as ways of amplifying, brightening, and lifting up his main accord. After he sniffed them individually and gave his approval, we had our finalized list of elements. My idea was the one that I had mentioned earlier, a ylang-ylang floral oriental with a quasi-gourmand streak, and with a possible working title of “Golden Luxe.” (I know, I know, it’s terribly cheesy, but I was hopelessly sleep-deprived and jet-lagged!) I had a definite idea as to the notes I wanted starting first and foremost with the Peru Balsam, the oily sap from the bark of a Central American tree called Myroxolon. I’d always loved Peru Balsam but I’d now become utterly obsessed with it, in part due to its unexpected contrast to AbdesSalaam’s Vanilla. Both from the top of the vial and on the scent strip, the vanilla was surprisingly woody, unsweetened, and almost dry. It really didn’t smell at all like the vanilla extract or the raw paste from inside the beans that I had expected. While that subsequently changed and the scent strip eventually displayed all the aromas with which we are so familiar, it took more than a day to reach that point. In contrast, the Peru Balsam was sweet from the start, with a quiet spiciness that sometimes resembled cinnamon, in addition to an almost syrupy, dark richness. I knew what I wanted for the other notes as well. Previously, in a different context, AbdesSalaam had mentioned that tonka adds a golden smoothness that works really well in ambered compositions. So that would be one note, possibly even as a fourth main accord, despite his formula preference for having only three notes there. I also wanted the patchouli and mandarin that I love so much, thinking that the latter’s tangy brightness would add a necessary “lift” to the heavier notes in the same way that it did for my beloved vintage Opium. 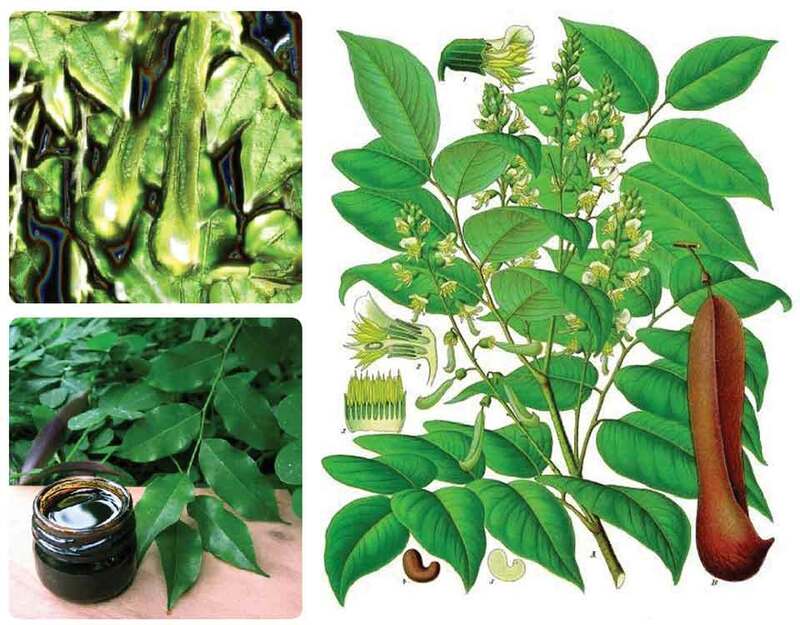 Ylang #1: 8, 8, 10, 6 (32). Peru Balsam: 8, 8, 4 (20). Patchouli: 4, 3, 2 (8). To be precise, though, some of those later additions were edits done the next day, once I had smelt how the blend had settled. For example, the ylang was no longer powerful or central enough, so I added 6 more drops. The patchouli needed shoring up, too, so that was increased by 2. 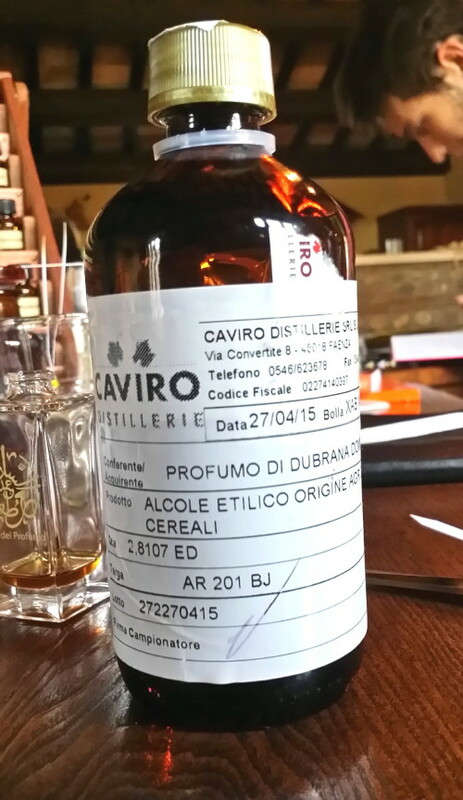 Caviro perfume alcohol. Caviro is apparently one of the best brands in Italy. Photo: my own. The total number of all drops was now 89. Sometimes, AbdesSalaam would have us double a formula if the overall quantity of drops was low, but 89 was sufficient to finalise the scent by adding alcohol. This was a stage where I had a little difficulty, because it was hard for me to believe that the alcohol would not dilute the overall blend. AbdesSalaam said that it wouldn’t but, if we felt a fragrance was now lighter, we could just spray ourselves a second time. It felt counter-intuitive to me that dispersing the oil in liquid would not weaken it, but he was the expert and I was the dummy, so I followed his directions. I carefully poured all the blended oil into a larger bottle, and then added alcohol up to the very top. The very final step is to seal the perfume bottle. AbdesSalaam gave me an atomiser spray top, then pointed me to a silver contraption that looked like a fancy wine opener. 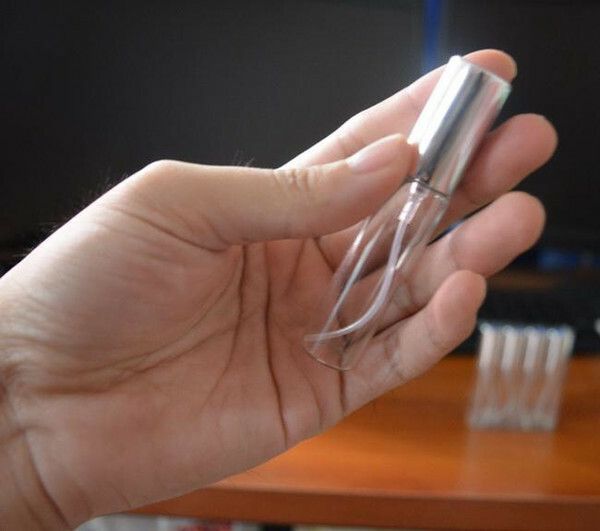 In reality, it was a crimping machine that folds down over the metal base of the atomiser top, tightening it and binding it so that no liquid seeps out. While AbdesSalaam was expert enough to use it solo, we always teamed up; one person held the bottle so that it wouldn’t accidentally tip over, while the other (usually Manuel with all his muscles) pressed down on the handles to seal the bottle. AbdesSalaam’s crimper on a table with perfume alcohol, empty bottles, and a number of his own finalized scents in mini sizes. Photo: my own. I now had my first full, proper perfume, at least in terms of having a complex set of notes. Manuel came up with the name “d’Oré” (Golden) which he wrote on the label and which seemed better than the cheesy “Golden Luxe,” but I’ll be honest, deep down, I wasn’t rapturous about any of it. The scent didn’t smell like the olfactory bouquet that I’d originally had in mind, the name wasn’t a perfect fit, and something just didn’t seem… perfect. There it was again, the perfectionist’s gnawing doubts, the endlessly self-critical, nagging feeling that things can always be better and be improved upon. Part of it was me, and part of it was the issue of detail. When I fall head over heels for a scent, it generally tends to be for complex, bold, Wagnerian and/or divaesque fragrances, with the singular exception of my “comfort scents” where simple snuggly coziness fits the intended purpose and is ideal (so long as there is also opulent luxuriousness to accompany it). Here, I kept thinking that an additional ingredient or two (or three!) might have given “d’Oré” a spark or head-turning ooomph. AbdesSalaam tried to reassure me that when something is good, it’s good. I clearly looked dubious, because he added that there will always be someone who likes what we ourselves do not, a lesson that he tried to teach us when we made perfumes in accordance with client briefs. And he did have a point, because there were things I made and didn’t like that others thought were good. Manuel even said he wanted my bottle of one of them, kind soul and good friend that he is. As a whole, though, I was hyper-critical of every perfume I made, particularly in the early days, and they would have been ripped apart had they been the subject of a review on this blog. AbdesSalaam soon realised that it was the nature of the formula that I was struggling with. Something about the process that it entailed and its limitations on notes didn’t feel organic or natural to my personality. And I struggled even more when using that formula to work with materials far outside my scent preferences or comfort zone for client briefs. (Seaweed, hay, and chocolate in a perfume, were they mad??!!) I quickly concluded that I could never be a custom perfumer, forced to follow client’s strict set of notes, and unable to make changes (or to stare at them as if they’d grown two heads). Others in the class could, but I’m well aware of my own limitations. Later, AbdesSalaam suggested an approach that better suited my love of details, multiple notes, and layers. I was still overly critical of my efforts, and I still thought that others (like Manuel) had an innate talent for perfume-making that I lacked — but at least I now had an approach that I felt really comfortable with and, equally important, that resulted in fragrances I liked much more. One of them was even pure love, though the scent subsequently changed quite dramatically when I got home after it had settled for two weeks. I’ll talk about that in Part V, after explaining the language of perfume, how olfactory archetypes let you know what stories to tell through your creations, the sorts of things we made in accordance with client briefs, some of the new materials we used like Rosewood and the “curiously nasty” Violet Leaf, and our “signature scent.” Part VI will cover the animalics and what they smelt like. 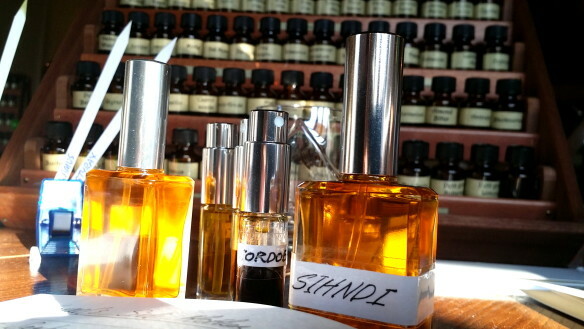 Part VII will conclude the series with a look at perfume psycho-aromatherapy, distillation, final thoughts, and information on the next perfume seminar. This entry was posted in AbdesSalaam Attar La Via del Profumo, All-Natural Fragrances, Perfume Profiles or Interviews and tagged AbdesSalaam Attar, AbdesSalaam Attar Perfume Course, Dominique Dubrana, Guide to making perfumes, How to blend perfume oils, how to make perfumes, Italian perfume course, La Via del Profumo perfume course by Kafkaesque. Bookmark the permalink. How marvelous to wake up to yet another wonderful post. It is so generous of you to take the time to share all of the details of your brilliant adventure with us your underlings. This I’m sure instills in each of us the nagging desire to try our own hand, though I’m sure my attempt would end in a jumbled “hot mess.” I eagerly look forward to the next chapter of this engrossing saga. Sounds like you made some good new friends in the process. Manuel looks and sounds like a sweetie. I once had the opportunity to “make” my own perfume and I initially kept coming back to the same ingredients over and over again, but nothing was grand or splendid. I know, after reading your latest chapter, that it was because I wasn’t sufficiently acquainted with the various essential oils, let alone whether they were of good quality or not, and certainly, I’m aware that I don’t know how to really conceptualize a fragrance by its notes. I love the “comma” and the working with with others to accomplish their vision as well as creating your own. As to “perfection,” I heard recently that no one can achieve perfection, but that we can strive and achieve a perfection of intent. And that, dear Kafka, you have in abundance. I’m really loving this series. Thank you so much for sharing. Awww, you’re so sweet. Thank you, Ellen, for your kind words on the striving part. I certainly do try in more words than most. 😉 😀 heh. Joking aside, I really do think having a simple formula helps remove the intimidating aspects of the process and to get one used to thinking about how to blend. Even with all my issues on details, I appreciated its approachable simplicity. I simply wanted something more complex afterwards, but it was invaluable as a first step. I’m sure that if you had had a straightforward formula to use in your own perfume-blending experiences, you would have liked the results. Do you recall what ingredients you went back to again and again? I’m sure one of them was incense! 🙂 Maybe you can try again but, this time, use AbdesSalaam’s “3 Main/3 Secondary” formula and see what happens. Frankincense, myrrh, and smoke oh my! Invariably when fragrances have those notes, those are the ones that I want. The blending experience was in Denver. Unfortunately, there is nothing like that where I live. Can’t wait to read Part V. Fascinating!!! I feel as though I were there. I can assure you that my Seaweed Cocoa fragrance was absolutely ABYSMAL!!! ROFL. I talk about that in Part V that I just posted, in the section on bespoke perfumery for clients. Truly, it was a hideous hideous concoction. (It had some lavender in there, too! lol) Yet, even that was fun to make, because there is something so creatively rewarding about perfume-making. In many ways, it’s a lot like cooking or painting, except your paints are liquid essences. More thanks for sharing with us. This all sounds like enormous fun (to say the very least)!!!! It was a lot of fun! And I’m glad you enjoyed the post, Julie. So I’m reading along and even before the paragraph finished I found myself thinking “oh god, I hope she uses the Egyptian Jasmine!” Et voíla! Purely and selfishly of course, because personally too much indole and I run to open all the windows and doors! Another great entry! And thank you for sharing all your failures as your successes. It really brings the journey to life for me, and makes it an authentic experience, rather than the “perfect” experience often talked about in promo materials. (Sorry. I’m starting to get how much you like “perfect”!) LOL! Heh, I do like “perfect,” or at least trying to get things a bit close to it. 😉 But I’m glad you appreciated my failures because, really, it would be ludicrous to pretend I could start blending after having never done it in my life and almost never having dealt with natural essences, only to suddenly create “masterpieces” somehow. I was lucky if I achieved “moderately tolerable.” LOL. But practice does make… er… perfect (sorry, AbdesSalaam, perfection again! ), so if I had the time to keep at it, I think I would improve substantially. Unfortunately, I don’t have the time these days, but I hope that will change at some point. Wow, that is really fascinating. 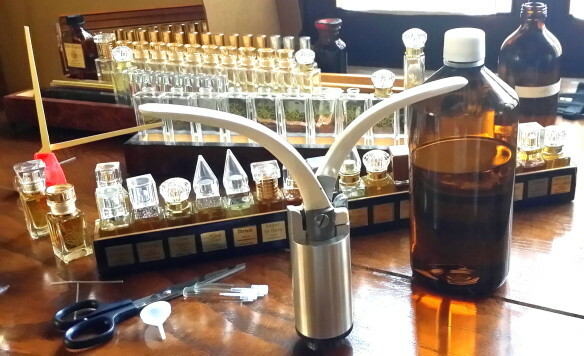 Making your own perfume, how exciting. I’m sure I would have been critical of anything I developed as well. The Sindhi mother scent sounds amazing. I was so inspired by your description of the Tasmeen extrait that I bought a decant of it from Surrender to Chance. I love ylang as well, it’s so rich and creamy. I adore Micallef’s Ylang in Gold, gorgeous ylang and vanilla… Looking forward to testing Tasmeen! Thanks again for letting us share in your wonderful experience. I so hope you love Tasneem, Ricky!! I’m glad you got a decant because that should allow you to spray, and I think aerosolisation will help a little with the projection since natural perfumes tend to be soft on the body. Do let me know what you think of the perfume when you get it. I want you to love it, but don’t be afraid to tell me if it doesn’t work for you. We’re all different and have different skin, after all. This class sounds like so darn much fun! I am not surprised at your perfectionist tendencies. I’d be the same way with that I think. I never think anything I do is good enough. I think my biggest issue would be my indecisiveness over what notes to use. Some would be easy to choose and others would have me sitting there afraid to put the wrong drop in and ruin the whole thing. You’ve got me thinking about what my original perfume idea would contain. It’s an interesting idea to play with. I’m loving these posts on your experience. Thanks for sharing. It was a lot of fun, Poodle, and I think you’d get over your indecisiveness quickly. At least, with the familiar notes that you already know you love. 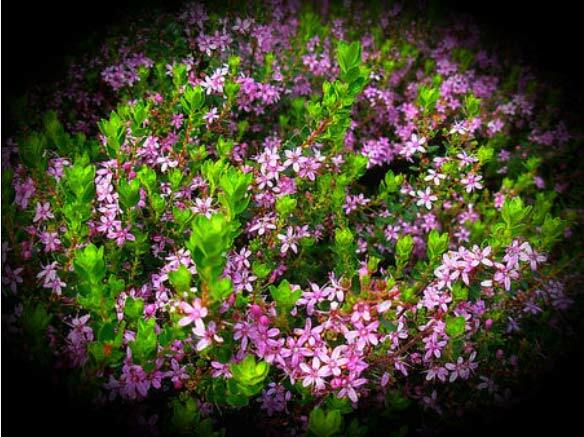 You would feel more confident in what to select, while something like Buchu or the goaty Valerian would be an entirely different matter. If you love the artistic or creative aspects of cooking, then I think you’d really enjoy perfume-making because they are similar in many ways. Absolute” + Kafka = “blown away”, though that’s due to the high quality of a single note. Vanilla that isn’t sweet is surprising too. I can’t even imagine what Buchu smells like, alone or blended. No, Luxe or d’Oré wasn’t akin to Opium, but another fragrance I created was completely inspired by vintage Opium. I talk about that in Part V that I just posted. As for your “perfect” perfume, I know it would definitely include Rose. If you ever order anything from AbdesSalaam, you can order vials of his different essences, including his Rose Absolute to try. Or you can write to him to see how much a bespoke rose scent would cost. My Wagnerian K. Thanks for this post. I have enjoyed them all. Give me any time golden luxe. I adore golden auras. I’m trying to imagine sandalwood, cardamom, almond, and Egyptian jasmin and it makes me think of a warm embrace. 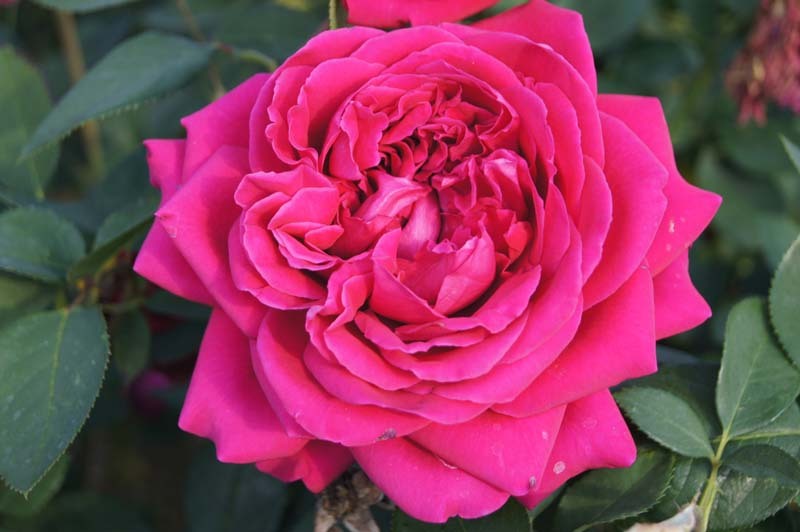 It may be I need Abdessalaam’s natural, high quality roses to change my mind about them; I enjoy rose scented everything in my body and skin care but turn into sour poo-pourri in perfume form. I love the idea of trying to capture your table’s partner vision since it feels like a direct connection to someones deep emotional memories. Like you, I cannot settle for or understand just good and always strive for the elusive excellent, divine, perfect: a lesson in humbleness from the mind of a creative and humble man. Ayyyy. Hugs to you my dearest. A lovely post. I’ve only just discovered your blog, and am glad I did. I think a lot about the pleasures of smelling and wearing scent, but not about making it. In fact, I had no idea — or even any preconception — about its creation. I loved this description of the process; it gives me new insight to what I experience when I wear or smell a fragrance. First, welcome to the blog, Judith! Second, thank you for your kind comments on the post. 🙂 If you think a lot about the pleasures of smelling and wearing scent, you may enjoy Part I of the series which is primarily about the philosophical, spiritual, ancient, cultural, and biological aspects of scent in our lives. There may be a few points that you might possibly find yourself relating to. In any event, I hope you’ll stop by again. Have a lovely week.